For search engine optimization (SEO), keywords are the very important, the relationship between you and your prospects, established and indexed by the search engine. Users search on words or phrases, and, if your site is well optimized, your pages turn up in the search results (Top Pages). That’s because keywords are the first things you should learn about when you start to optimize your blog for SEO. Today in this post we will discuss about Importance of keyword in SEO. You can go to the SEMrush site and type in your web site’s address to see which keyword(s) you are ranking for just see.. This is the specific phrase which is driving traffic from a specific URL. When doing SEO, this is the phrase that we “target”, so we often call it the “target keyword” otherwise “focus keyword”. This is the position of the keyword in Google Search (i.e. ranking). For instance, if it’s number 1, it’s the first result that Google shows. If it’s number 6, it’s the six. And so on… Your focus should be to rank on the first page of Google for your target keyword (Pos. 1-10). 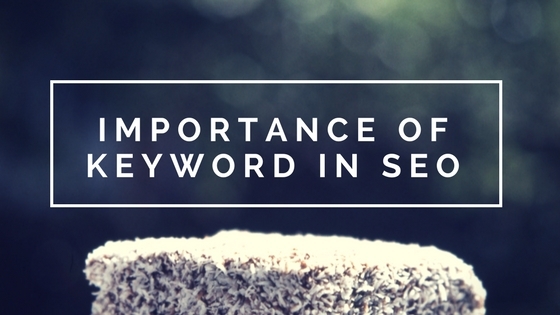 What is the importance of keywords from an SEO perspective? When we “SEO-optimize” a blog post or a web page, we have the option to define our target keywords. This kind of keyword is known as a Meta_keyword. before 2017, it was important to specify meta keywords on webpages, but in 2017, it’s not of any use. The search engine algorithms have become much smarter; they now auto detect keywords and rank pages automatically. Google has already made it clear that they do not consider meta keywords when selecting keywords. How to Start With keyword research There are many online keyword research tools by which you can find best keywords and do keyword research. 1. Find Keywords with SEMrush: This is an online keyword research tool that lets you find keywords, sees which keywords your site is ranking for and allows you to spy on your competitors. A good idea is to start picking the top blogs in your niche and add them into SEMrush to see which keywords those sites are ranking for. From here, you just need to start building unique and high-quality content around those keywords. 3. Kwfinder – Best tool to find long tail keywords in any niche. 4. Thehoth – Find the best keyword with result and monthly volume. It’s is most important to choose and include right keywords carefully in your website, so that the search engines able to easily understand the subject and intent of the page. So if you want to show up your website in top positions in major search results to drive quick organic traffic, then you need to optimize your every page and its content of your website for those relevant and right SEO keywords.